When selecting plants for any garden, I am always mindful of the micro climate of the garden so as to ensure the selected plants will do well and for aesthetics, I also consider the architecture of the building. Therefore I have had to make some assumptions with the selection of plants that I am making in this article. The first is that the balcony receives both sun and shade at various parts of the day, and that hardy plants requiring minimal maintenance would be the preferred choice of most people reading this article. Learn more about Balcony Gardens here. All the plants that I have selected do very well in our Sydney climate, will tolerate some dry conditions and grow well in pots. Plants look great en masse, so depending on the size of your balcony and the color concentration you are seeking, will determine the numbers of each plant that you might select. The Agave 'Blue Glow' (Pic 1) is a beautiful architectural plant with an unmatched blue hue to it's foliage. It's a little spikey, so it might be best if it were placed behind another pot so you do not brush against it. Casuaring glauca 'Cousin It' (Pic 2) is a fun plant. It is the front plant in the second pic above, and maybe now you can appreciate the origins of its name. It is a hardy Australian native, and a prostrate version of the She-oak tree. It is becoming a very popular choice for water wise gardens. 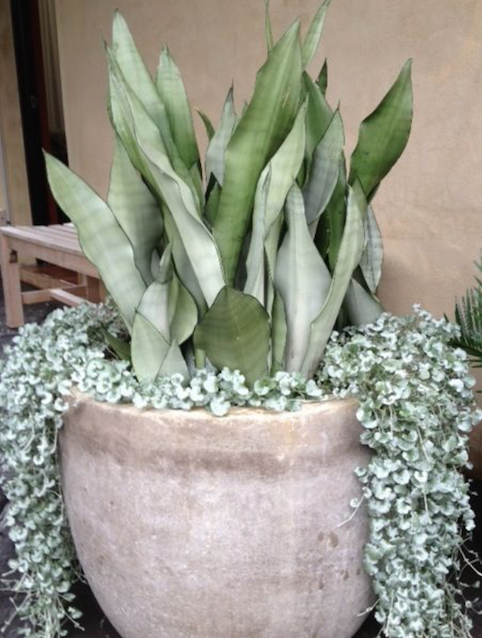 I like to use Correa alba 'Star Showers' (Pic 3) in pots for contrast. 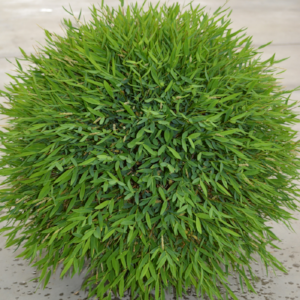 It is really a ground cover, so it has a low form (approx 350mm high) which falls whimsically over the sides of the pot. White flowers appear from Autumn to Spring so it adds some color to the balcony during winter. Although a succulent, Crassula undulatifolia 'Max Cook' (Pic 4) has dense deep green foliage which grows naturally in a bun shape. It is one of my favourite plants that requires little maintenance to keep it dense, this avoiding the leggy look of some other Crassula's. Dichondra argentea 'Silver Falls' (Pic 5) is a stunning addition to any garden with a small wall or collation of pots. The plant cascades beautifully over the side like a shower curtain, and is great for softening any hard edges etc. It contrasts spectacularly with charcoal pots or walls. Echeveria 'Blue Curls' (Pic 6) is another succulent, and I like to use it in a small white pot to decorate the balcony table. For a textual change and a softening of the plant palette, I often use Pogonatherum paniceum (Pic 7).Commonly known as Baby Panda Grass, it is neither a grass nor bamboo, and provides a loosening or more casual tone to the garden. A plant that is used in many situations is Raphiolepis x indica 'Oriental Pearl' (Pic 8). Grown in a pot will reduce its ability to mature to shrub proportions, it's foliage is dark green constrasting nicely with the grey greens of some of the other plants I have recommended. It shows small white flowers in Spring. An architectural plant that can be grown inside and outside is Sanseveria trifasciata 'Moonshine' (Pic 9).The species is commonly known as Mother's Tongue, but with many cultivars. I like this one, with its light green coloring. It is equally comfortable in sun and shade, You may see it as 'Silver Sword' or 'Silbersee', which are effectively the same. 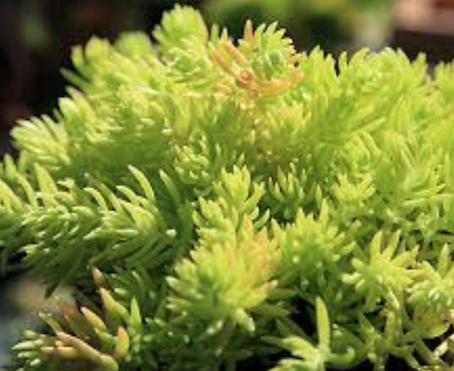 For underplanting or for use in a low bowl, Sedum cultivar 'Gold Mound' (Pic 10) is great for a bright color variation, yet still manages to remain a little understated against its larger neighbors on the balcony. 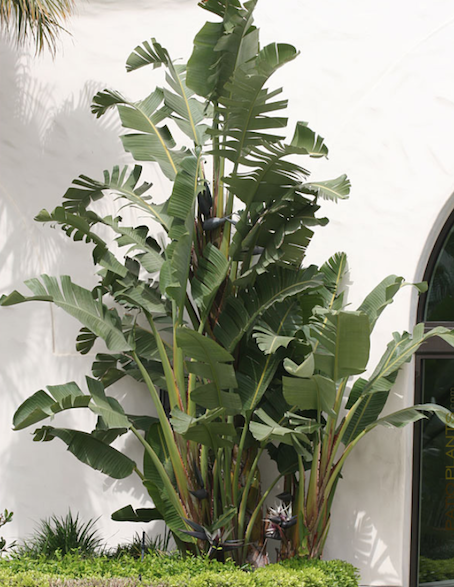 For a vertical statement on the balcony, reliable plants include Strelitzia nicolai (Pic 11) or Yucca elephantipes (Pic 12). 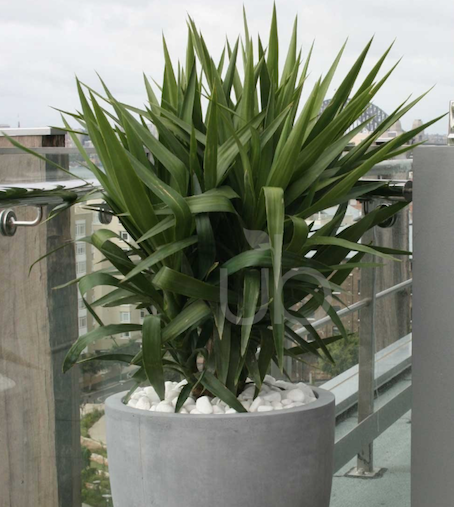 Both could be used on a larger balcony, if planted close together in adjoining pots, otherwise use only one or the other at one end of the balcony. There are many plant options for balcony gardens so depending on your cirumstances, there is no need to restrict yourself to just the above. Hopefully though, it will start you thinking about the possibilities and motivate you into looking at other plants options that may align with your personal style. For further inspiration contact Brian, he would love to assist.